As you probably know I’m trying to take better care of myself recently. After 26 years of abuse my hair is crying out for help. In my teens my hair was every colour of the rainbow and more, which, when you have dark hair like me means a lot of bleach. Evidentially the end of my hair feel like straw while the roots get really greasy really quickly and as a result I wash my hair daily/every other day which resulted in me blow drying my hair and then straightening it after. In a conscious effort to try and restore my hair to some degree of health I changed to a clarifying shampoo, started using a moisture conditioner, oils and a natural brush. I have seen a vast improvement in just under a month! The cuticle (the outer layer) lay smooth. All of it’s “scales” are lined up and flat, one on top of the other. Flat cuticles mean more light reflection and SHINE! This is a slightly raised cuticle.This is an average person’s hair looks like if they use a blow dryer. This can also be attributed to towel drying. It is important not to rough it up. Work your way down the hair patting it dry. Alternatively scrunch it if you’re going for waves. Using a T-shirt to dry your hair can be more beneficial to your hair and can cause less frizz. Main causes are bleaching, colouring, obsessive heat styling, using too many alcohol based products , shampooing and not conditioning, etc… This is bad news. Thisa will leave your hair looking dull and lifeless. This surface can’t reflect light so no shine. Hair Bootcamp is a must for this hair. If you don’t change your routine, you’ll be looking at breakage very soon. D. This Hair WILL Eventually Break Off. This is caused by harsh detangling. Never brush through a knot. Take your time and comb it out slowly. I also get knots out with a brush instead of a comb. Sometimes the single row of teeth on a comb can actually tighten the knot. Another major cause of this is yanking out your ponytail. Stop yourself and work the tangle around the ponytail holder out slowly. Sadly, once you have caused this damage to the middle of your hair there is no way to repair it. This will cause hair breakage leading to fly-aways and split-end. 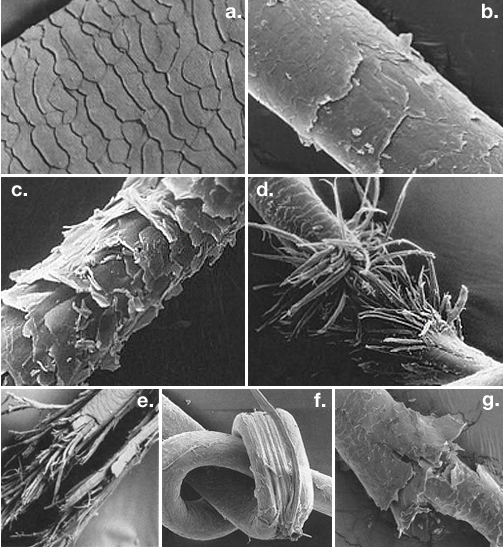 Seeing what split ends look like under the microscope has helped me understand how they get stuck to each other causing tangles. Tangled ends cause even further damage. It’s important to get them cut off regularly. If not properly and carefully brushed out, a knot will lead to “example d.” Just brush it out slowly and gently with a brush. Often caused by a bad application or rough removal of extensions. Another cause could be a bad perms. I know your thinking “Who on earth still gets perms?” Well some people do! If you are, please be sure to visit someone who specialises in that. If you have extensions, make sure the person doing them is gentle, takes their time and isn’t too aggressive with your delicate hair! Read more about my 30 days no heat challenge.